Use this HIS cord to connect any Plantronics headset directly to your 96xx or 16xx series Avaya telephone headset port. Only purchase this lightweight cable if you have one of the phone models listed below. Quick Disconnect (QD) capability allows the headset to detach without you losing the call. 9601 SIP Deskphone; 9608, 9611G, 9621G, 9641G, 9620L, 9630G, 9640G, 9650C, 9670G IP Deskphones; 1603, 1603SW, 1608, 1616 IP Deskphone; 16CC Agent Deskphone. 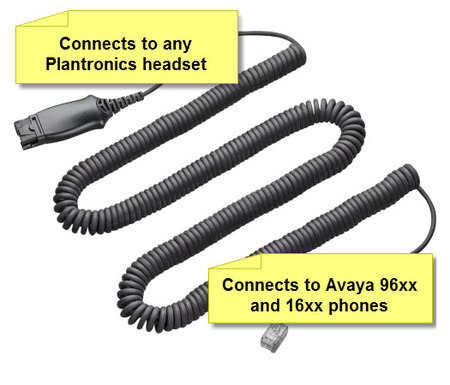 For Avaya 2400/6400 and 4600 phones you need the HIC cable.